Window shutters Wirral by Just Shutters. Your local family experts that stock the widest range and finest choice of stunning Plantation Shutters in Wirral. Just Shutters North Wales and The Wirral offers quality shutters, second-to-none service and great prices. What’s more, we offer an industry leading LIFETIME guarantee! Call us on 01244 567 890 or book an appointment here. Local husband and wife team Ken and Angela, run Just Shutters North Wales and The Wirral. The area is home to some of the most beautiful country towns and villages, steeped in heritage and history. We possess an extensive range of products, therefore with our know-how will enable us to create the most beautiful solution for your home! Regardless of the age or style of your property, be it an apartment with sea view, a townhouse, or country cottage, we will find the most suited option . 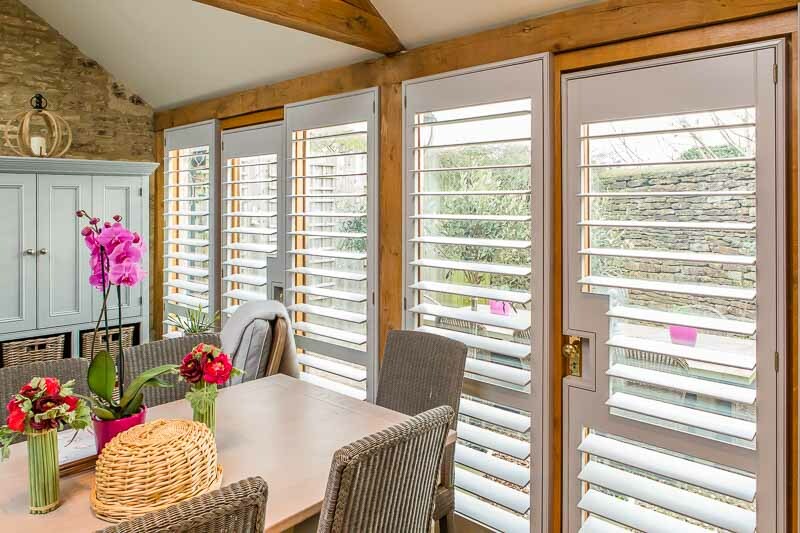 Furthermore, you can get inspired about what plantation shutters could look like in your home by viewing our stunning photo galleries. Shutters are stunning! They make a design statement; widening and brightening any room. However, the beauty of shutters is not just skin deep! While their striking good looks are often what attracts a customer, their range of many practical benefits means that the benefits go far beyond the aesthetes. Making the love affair last a lifetime – along with our guarantee! Furthermore, we are so confident in the quality of our shutters that we offer a lifetime guarantee! Therefore, you can rest assured that your shutters are a wise investment. Don’t just take our word for it! Click here to see the top 10 reasons for choosing plantation shutters as voted for by our customers. Just Shutters are the specialist Plantation Shutter company. Our core business has been trading since 2006 and we have grown with our customers, earning a second-to-none reputation along the way. Each time we grow, we do so with local family businesspeople who share our vision and passion. As a result, this gives our customers the very best of a larger company that can offer the best prices and warranties, but the true local service and personal investment that customers deserve. We take customer satisfaction seriously, therefore we are incredibly proud of the 1700+ reviews on independent website checkatrade.com which as a result have given us a 9.9/10 score, we are working on the other 0.1%! We offer the widest choice of styles, materials and finishes in the UK, we also stock our own exclusive ranges. As a result, we are confident that we have shutters to suit anyone’s style. If you would like to know more about our beautiful shutters, to arrange a visit or ask a question, please call us on 01244 567 890.